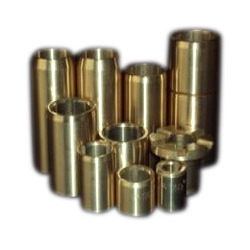 We are recognized as one of the leading suppliers and Exporter of Pin & Bushes. Our product range is manufactured at our high end fabrication unit under the strict supervision of our trained. Pprecision bushings, centrifugally cast with complex profiles offer exceptional performance on engines, turbo-compressors, pumps, turbines and other rotating machinery. We are one of the renowned manufacturers of Bushes which are high in demand by many customers in all around the world. To be used for Expander® sealing plugs with elongated pull-anchor. Being a leading enterprise of this industry, we are offering a huge range of Precision Silent Block Bushes. In line to meet utmost satisfaction of consumers, our firm offers Precision Turned Bushes . These bushes are best in quality and finely inspected by professionals. These products are smoothly finished with the use of best machines. We charge minimal price for this turned bush. Backed by a rich industrial experience, we have come up with a world class assortment of Precision Turned Bush. Our well facilitated infrastructural unit enables us to make a highly qualitative Precision Bush, which is developed by making use of excellent quality components. With the support of our customers, we are able to provide our clients a qualitative range of bonded bush. These bushes help in reducing shocks and noises caused by vibration. Our products are widely acclaimed by the clients for its high performance and low maintenance. We are providing superior quality Precision Bushes. These Industrial Bushes are processed using quality material under proper supervision. These are available at market leading prices as per client specification. The Sangli Forging & Metal Industries Pvt. Ltd.
We are offering our valuable customers a wide range of Precision Machined Bushes. these machines are available at market leading price and these bushes are available high quality raw material. We are looking queries only from Mumbai. We offer high quality range of Precision Bushes. Our range is manufactured using extreme quality raw material. We are providing superior quality Precision Bushes. These Industrial Bushes are processed using quality material under proper supervision. our product range is well-reckoned for its durability, resistance to extreme.